 FM Approvals has recently learned that two models of Globe Fire Sprinkler Corporation (Globe) automatic fire sprinklers have been counterfeited and distributed in the North Africa/Middle East market. 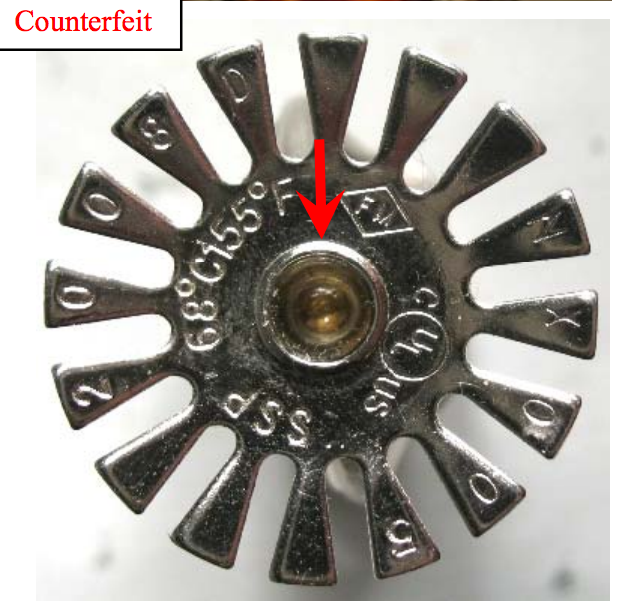 The counterfeit sprinklers were found in the country of Egypt. Please see Table 1 below for a list of models and descriptions of the sprinklers found to be counterfeit. 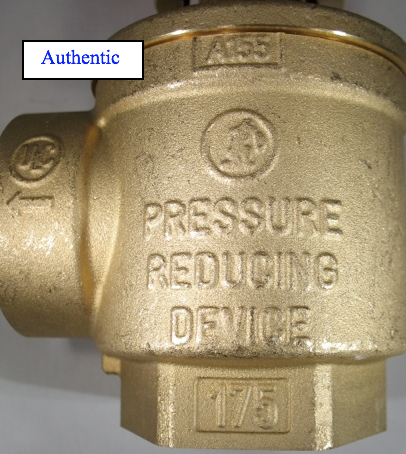 There are several telltale indicators that differentiate the counterfeit from the authentic sprinklers. The photographs below illustrate these differences. 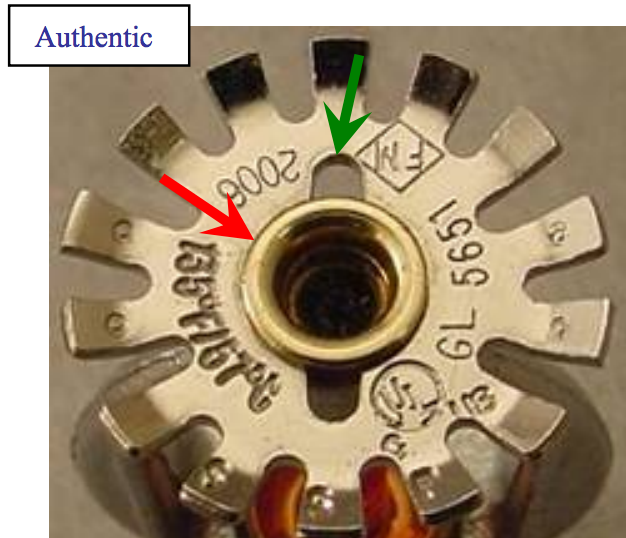 Figure 1 depicts representative samples of an authentic (right) and a counterfeit (left) model NX005/GL5651 sprinklers. The finish on the frames of these counterfeit examples is almost identical to authentic examples and cannot be used to identify a counterfeit example as has been the case in the past. One visibly apparent difference is the profile on the load screw, indicated by the red arrows. The load screw threads on the counterfeit sprinkler extend down to where it contacts the bulb, as opposed to the authentic sprinkler, where the threads terminate just below the load screw boss. The load screw diameter also tapers inward down to where it contacts the bulb on the authentic sprinkler and does not on the counterfeit. 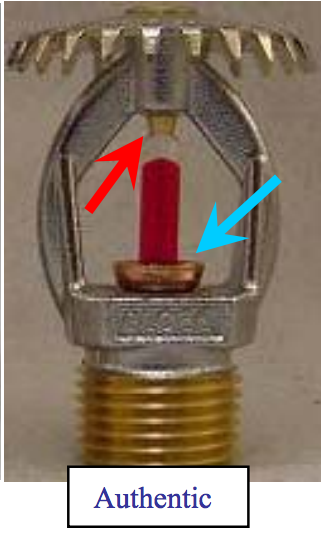 The bulb seat is also very different on the counterfeit sprinklers, indicated by the blue arrow. The counterfeit uses a chrome-plated, machined seat while the authentic Globe sprinkler uses a stamped, copper colored seat. The counterfeit seat lies flush with the frame while the authentic seat extends up above the frame. No PTFE coated seal is visible around the edge of the counterfeit seat because it uses an o-ring type seal rather than a PTFE coated spring-seal. Figure 2 shows the differences in the deflectors of the authentic (top left) and counterfeit (bottom left) sprinklers. The authentic deflector has tines of almost uniform thickness while the counterfeit deflector has tines that taper from thin to thick towards the edge of the deflector. The slots between the tines on the authentic example vary in depth while the counterfeit deflector has uniform slots. The authentic deflector has two slots toward the middle of the deflector, indicated by the green arrow, and a brass colored roll-over, indicated by the red arrow, while the counterfeit example has no slots and has a chrome colored roll-over. Finally, the markings on the counterfeit sprinkler are different and include the Sprinkler Identification Number (SIN) “NX005.” This SIN is not used by Globe, but by Nanjing Fire Protection Technology Co., Ltd. Figure 3 shows enlarged views of the thermal activation elements found in the authentic (top) and counterfeit (bottom) sprinklers. 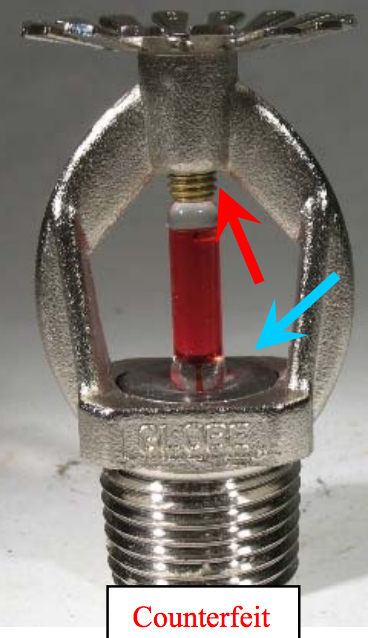 Note the authentic Globe sprinklers utilize the Job model G5 bulb while the counterfeit sprinkler uses a bulb of unknown origin marked with “YH-5.” Also more clearly visible in the photographs are the differences in load screw end profiles that were pointed out in Figure 1. Figure 4. The counterfeit GL5661 sprinkler also employed a different load screw than the authentic (smaller) denoted by the red arrows in the photograph to the left. The differences in the bulb seat are also apparent in this model. 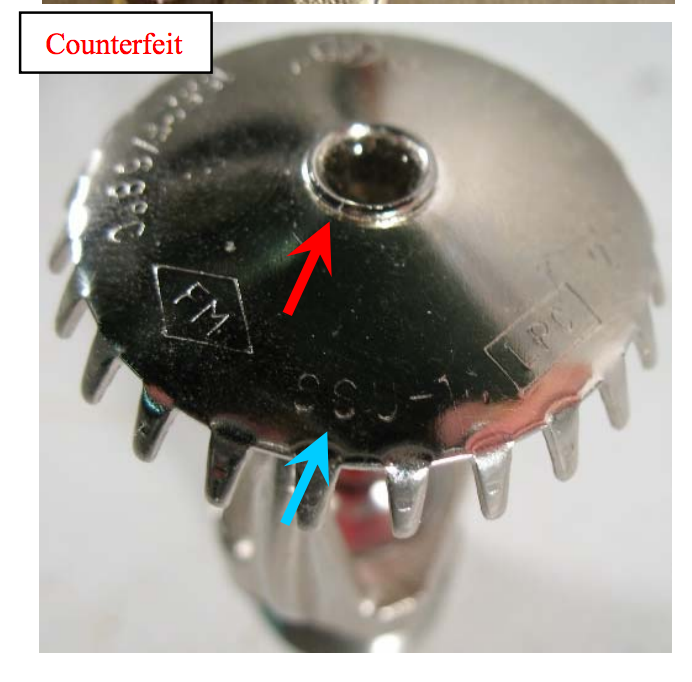 Again the counterfeit example uses a machined, chrome plated bulb seat while the authentic example uses a stamped seat. This counterfeit example also uses the o-ring type orifice seal. Figure 6 shows enlarged views of the thermal activation elements found in the authentic (top) and counterfeit (bottom) sprinklers. 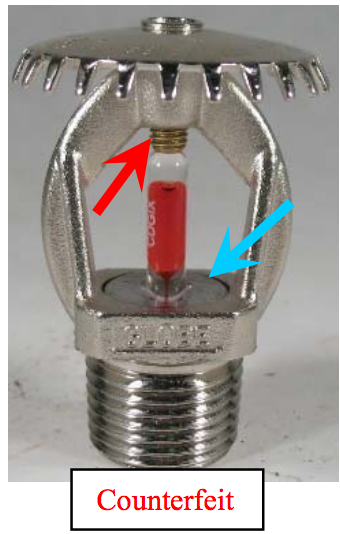 Note the authentic Globe sprinklers utilize the Job model G5 bulb while the counterfeit sprinkler uses a bulb of unknown origin marked “CDGIX.” Also more clearly visible in the photographs are the differences in load screw end profile that were pointed out in Figure 4.